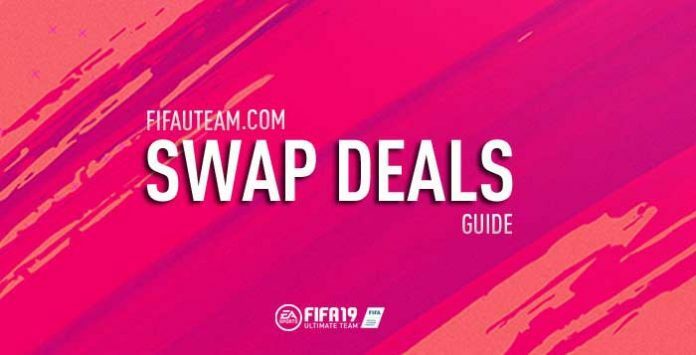 FIFA 19 Swap Deals are back! Earn great rewards by exchanging FUT Swap Players in special Squad Building Challenges throughout the season. Let’s find out how it works, the list of Swap Deals players and its rewards. Will you cash in early or wait patiently to get even better rewards? The fate of your squad is up to you in FUT Swap Deals, a FIFA Ultimate Team event that helps players upgrade their squads in fresh ways. How long this event takes? 📅 The FIFA 19 Swap Deal event runs throughout the season. ♼ You can keep with them or use them to complete specific SBCs in order to get special rewards. 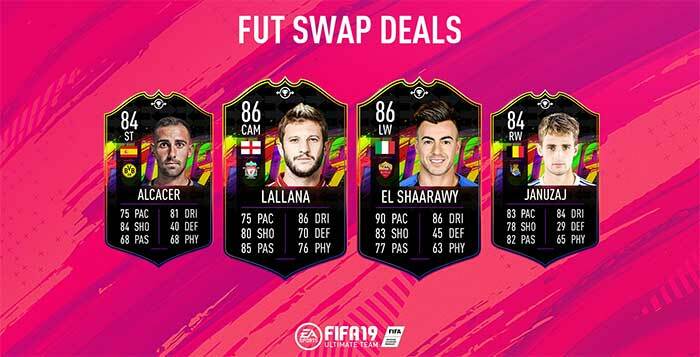 FIFA 19 Swap Items cards become available for a limited time. You can earn them by playing various FUT modes, including Squad Battles, SBCs and select Objectives. 1.1. They are not available in packs or in the transfer market. 1.2. 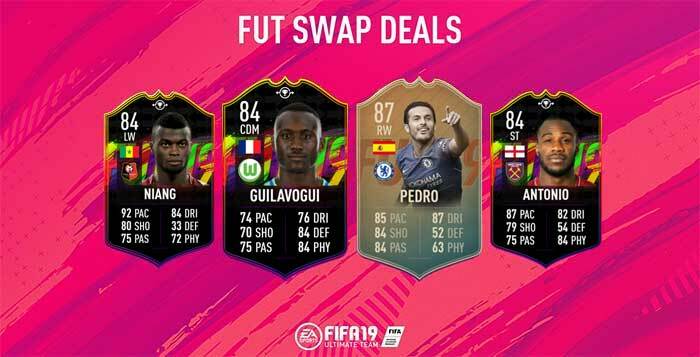 All Swap Deals SBCs are available with a range of progressively more valuable rewards in exchange for more FUT Swap items. 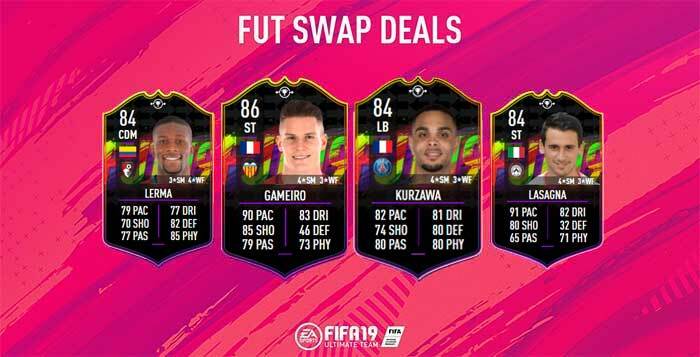 With limited FUT Swap Player items available during FUT Swap Deals periods, you won’t be able to get everything — so choose your FUT Swap Deals Rewards wisely! Hey Rodrigo, you don‘t need a player from Japan for the current SBC. Just one from Nigeria and one from England. Best regards, keep up your awesome work! 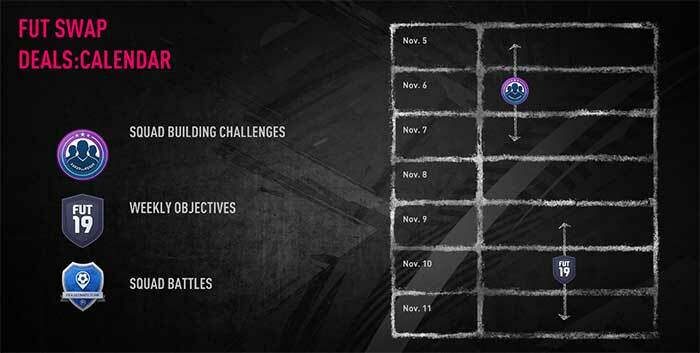 For this weeks objective; win 8 online matches. Can it be any online games? So could I play 8 online friendly single matches and they would count if I win? Yes, I believe it works, as long as it is online. Hello Rodrigo, is the Base Icon Player Pack reward for April tradable? Good question! I believe it is tradeable but not 100% confirmed. Do you guys think the swap deal for squad battles will be released at friday, so we can already earn it in this sb week? It is officially confirmed that you can get a swap deal player playing SB from April 5 to April 12. The item will be delivered to you on that date. I missed weekly objective and i haven’t got Michael Kessel. Is there a chance to get him in the upcoming days for completing all 14 players. We are sorry to hear about that. Unfortunately, there is no way to get him anymore. For month of January, all we have so far is 12 players available? Where do you get the remaining two? It will be announced soon. Keep an eye on this page since we will update it anytime there is a new player. Very Nice site.. Help me alot. Just find it now.👍🙂 The Page is bookmarket. 🙂 Are you workingb, for fifa? Thank you. We have nothing to do with Electronic Arts. Need to add friends to complete the weekly objective. If someone is also stick with this my ID is diasrivera I will accept any invite. Will I ever be able to use old swap players in the future? Or once their released month has expired they are rendered unusable? They will not be able to use in any future Swap Deals SBC. Follow us on Twitter. We tweet alerting people that they should swap their Swap Deals. Can i use swap deal 2 players in swap deals 3 sbc? Is there going to be another player sbc? No. The 14 players were already announced. Is plogmann the 14th player? Or is there another to come? You can win these 3 until November 30. If you already have them, then Plogmann is the 14th player. I have 6 now can i reach 14 or 9 before the November fut swaps ends?? The page is updated, so you can check yourself if you missed any player. Rodrigo, is there a way to get another chance on a swap item if I missed it? It says there’s a swap deals SBC today but there doesn’t seem to be one. It was released yesterday. The next one will be released Friday. The date published for each card is the date of the announcement and when the ‘challenge’ starts. To make things clearer, we added the time for each item. 19/11 is the date that the task was announced. That card will be delivered 7 days later. No, it’s just 14. The full list is published in this page. Which is better, Michael Antonio or Niang ? Nothing. It’s useless to swap by rewards. is any swap player will be released today ? Which fut swap reward do you think you should take this time if you can get all of them? Is it worth getting the 100k pack or the flashback Pedro if you’ve already got the POTM Lucas? In my opinion, you should always take the players. In your case, if you already have POTM Lucas, there is no reason to ‘buy’ Pedro. Josuha Guilavogui looks to be the best value for ‘money’ but it depends on the squad you have. I’m down to the wire and have 6 or could get 1 more for 7 total. Debating taking the 2 84s, the Prime Mixed Players and an 84 or the Premium Gold Players. I don’t have any use for the players except possibly SBCs down the line. I know the packs are a gamble. What’s the best move here? I got lallana and i have 2 more swap card should i take 2 silver packs or i can use them somehow in the future ??? We believe you will not be able to use them in future (however EA wasn’t explicit about that). Servers are back. Easy SBC. El Shaarawy in my squad. I am coonfused about something, let’s say I don’t redeem this October players, and in November they come out with better well sbcs cards , would I be able to use the October fut swap cards for those November sbcs? It is not 100% confirmed but we believe that October’s items can only be used to redeem October’s rewards. No, it isn’t. Can you point us where you saw that? We are all getting wound up here according to futbin. Look at that it says hes been released. Actually it says 14 have been releases all in. Looks like lallana or shaarawy are long out the window. Thanks fifa! futbin is great but our information was correct. The last player was released yesterday. Any idea When the last one is coming? Since it will expire in one day..
No, it is not. FUTBIn is great but we are more accurate than them. how win the player RB: Zaldúa, Real Sociedad ??? We believe he will be announced today. Follow us on Twitter to be always updated about new swap items. I believe you will get it. Just pay attention to this page because we will update it as soon as that item gets released. Even better, follow us on Twitter since we will announce there. Yes, that’s the one that will be released until Nov 2. When Ea is thick about to release Zaldua? I really need him to get El Shaarawy! They’ve still got 1 day 18 hours to release the card. I think it will either be another sbc or a daily objective to complete. Almost sure it will be released Thursday. Any word on the release of the final Fut Swap item (RB, Zaldua; Real Sociedad)? Can i use my ocotber players in november fut swap? 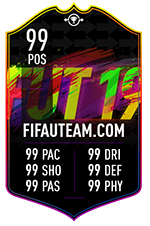 It looks that you can only use them until Nov 2.
when is EA giving that fut swap card.. 1 day remaining.. It ends on Nov 2. You will be able to use them until Nov 2. I currently have 9 Swap players, but should get to 10. Mega pack is a 35k pack and Prime Gold pack is a 45k pack. That’s why it requires more Swap players. I’m in Southern California (4:45 pm). I just logged on and I have nothing. I’m wondering if I need to wait until a certain time? Anyone else on PS4 having the same issue? I think Getting that Daily Objective is by chance only and randomly. Besides Zagadou (we believe EA will offer him), there is only one more. Any info on when the last player will be available? Probably Nov 1 via SBC. But doesn’t that kinda make him a November player? Or does he still count as an October player? No, he still count as a October player. If you look with attention to this page, you will see that he is in ‘October’ chapter. Okay then there’s no need to worry. I understood that he’s part of the 14 October players but you never know and the devil is in the detail.